Don’t let the name Rustic Lounge fool you. 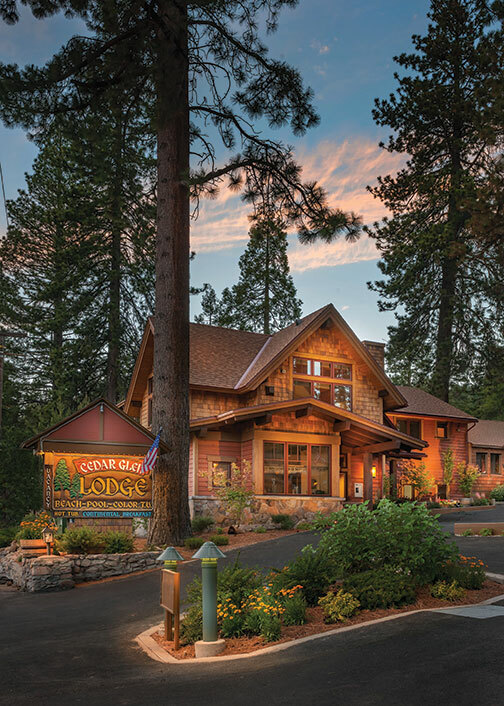 While the Tahoe Vista newcomer, with its granite stonework, sturdy beams and reclaimed wood, feels far from the big city, the food, ambience and service are fresh and sophisticated. Owner Martha Bryan, who lived in Marina Del Rey, bought the 1950s-era Cedar Glen Lodge in 2010. She began an extensive remodel on the property, including the two-story building added during the 1960 Winter Olympics that was ultimately transformed into a lobby bar and restaurant. The team of brain-stormers included her daughter Anna and son-in-law David Meade, who met while working at an L.A. law firm and filed for a career change via the Cordon Bleu College of Culinary Arts in Pasadena. The couple traveled in Europe and were working in Washington D.C. when they got a call from Martha wondering if they wanted to head up the kitchen in the new 24-seat dining room that opened in May 2012. The Meades signed on and created a menu that Anna sums up in one word: Fresh. “Absolutely everything is cooked to order, which can be the difference between an OK chicken and something really special,” she says. “Both Dave and I grew up in California, and we were fortunate to have families who place a huge value in food and cooking. This afforded us the opportunity to be introduced to a wide variety of different foods and cooking styles. It’s not uncommon to find a fusion of French, American, Japanese, Italian and Mexican on our menu all at once. The majority of produce comes from within 200 miles of the restaurant; go-to purveyors include Twin Peaks Orchard, Yeung Farms and Del Rio Botanicals. Seafood is wild-caught, beef is hormone and antibiotic-free and chicken is free range and organically raised. Dinner at the Rustic Lounge starts with David’s ciabatta-style freshly baked bread with a crispy crust, served warm from the oven with a cracked pepper parmesan butter, a tasty lead in to the line-up of savory first courses. Those might include wild shrimp atop a creamy lemony bowl of grits, or perhaps a pair of rich, sweet, perfectly seared scallops sitting atop a frothy base of brown butter, sage, heirloom garlic puree and pecan-wood smoked bacon. Maybe it’s truffled macaroni with English peas, bacon, toasted breadcrumbs and of course, a drizzle of earthy truffle oil. The artisanal and farmstead cheese platter, which is served with local honeycomb, truffled nuts, quince, charred ciabatta and organic Granny Smith apple, includes cheeses such as Chimney Rock soft rind cheese dusted with shiitake mushrooms from Cow Girl Creamery in Petaluma to Spain’s Cana de Cabra goat cheese. Second course could be a creamy corn soup made with chives and chive oil, of which a vegan option is available. Salads are generous: The artisan salad is mixed with Humboldt Fog goat cheese, candied pecans, macerated strawberries and raspberry red wine vinaigrette. There are baby heirloom tomatoes tossed with creamy burrata cheese, white balsamic and thyme vinaigrette, basil oil, micro basil and croutons. Raw shaved red, gold and Chioggia beets are combined with marinated baby mozzarella, champagne tarragon and vinaigrette. Main courses are simply prepared fish, fowl and beef. A roasted chicken breast is served with honey and garlic glazed root vegetables and sweet potato mash. Crispy skin duck comes with apple and celery root puree, baby heirloom carrots and pomegranate. Pan-seared salmon is plated with orange beurre blanc, fennel and orange salad and broccolini. A filet mignon is placed atop potato puree, wilted spinach and garlic butter, the whole plate drizzled with a balsamic reduction. Vegetarians are well fed with the gnocchi à la Parisienne made with summer squash, organic mini mushrooms, pea tendrils, lemon beurre noisette and almonds. The wine list features bottles from California, Italy, France and Spain, and is focused on smaller producers. While the restaurant is not licensed to sell liquor, it does stock specialty brews such as Beer Advocate favorites like Dogfish Head 90 Minute Imperial IPA and Belgian-style Ommegang Hennepin Farm House Saison. David’s pastry chef prowess—and Southern heritage—is on full display in the dessert line-up that starts with the savory “Pig & Pepper”—brown butter bacon cake, butterscotch cremeux (pudding), peppercorn ice cream, chocolate and candied pecans. The pear tarte tatin (an upside-down tart in which the fruit is caramelized in butter and sugar before the tart is baked) is plated with red wine caramel, Madagascar vanilla bean ice cream, cherry reduction, buckwheat honey tuile and pistachios. 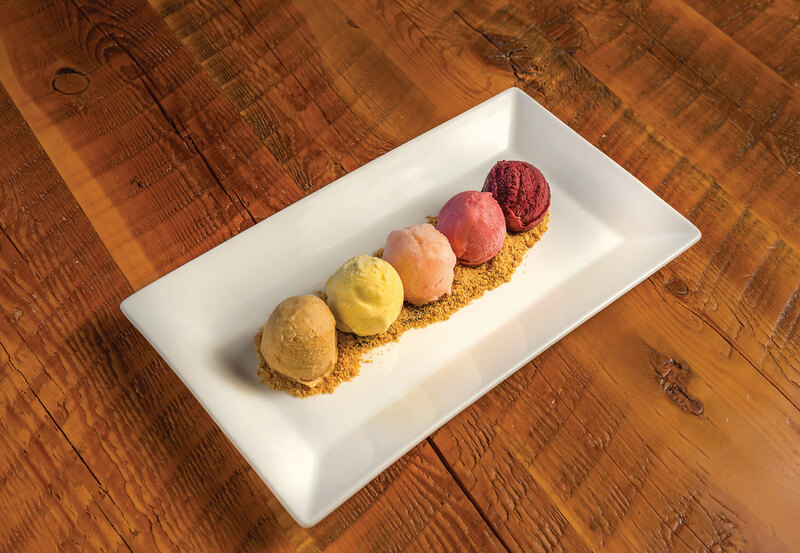 The tasting of five small scoops of house-made sorbets and ice creams—from kiwi to strawberries and crème fraîche—atop graham cracker crumbs are a light and lovely way to go. And of course, there’s the nod to the truly rustic confection convention, the s’more, in this case a warm chocolate petit four, vanilla marshmallow, salted caramel ice cream, hazelnut toffee, caramel and hot fudge. While rustic may be interpreted as relating to the countryside or made in a plain and simple fashion, we’ll take the lounge part as an invite to linger a little longer. Plain and simple.